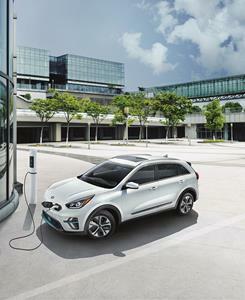 /EIN News/ -- TORONTO, April 17, 2019 (GLOBE NEWSWIRE) -- Kia Canada has become one of the industry’s only brands to offer two distinct electric models by announcing pricing today for the all-new 2019 Kia Niro EV and 2020 Kia Soul EV. The pricing comes on the same day that Federal government announced new incentives for electric vehicles was announced with both models meeting the requirements of the new regulations. For further information on the Zero-Emission Vehicles (iZEV) Program, please visit the Government of Canada’s ZEV website to view the announcement. For more information on the entire Kia lineup, please visit Kia Canada’s media site at KiaMedia.ca. Kia Canada Inc. (KCI), established in 1999 and celebrating 20 years in Canada, is a subsidiary of Kia Motors Corporation (KMC) based in Seoul, South Korea. Kia’s full line of award-winning vehicles offers world-class quality and customer satisfaction through a network of 194 dealers nationwide. The company employs 170 people in its Mississauga, Ontario headquarters, various locations across Canada and at its regional office in Montreal, Quebec. Kia’s brand slogan "The Power to Surprise" represents the company's global commitment to surpassing customer expectations through continuous automotive innovation. From compact to crossover to industry leading EV’s, every Kia delivers an extraordinary combination of precision engineering, outstanding performance, innovative features, and advanced safety systems. Having sold close to one million vehicles, popular Canadian models include Soul, Sportage, Sorento, Forte - winner of 2019 AJAC Best Small Car and Stinger – winner 2019 AJAC Car of the Year. To learn more about the Kia advantage, visit kia.ca or Facebook, LinkedIn, Twitter and Instagram.